Sea buckthorn has been known for it’s medicinal purposes for 1000’s of years. Historically, it is world renown for it’s use by the Ancient Greeks and the Mongol army. The berry was legendarily used for Greek race horses, to recover war-torn horses after battle, and to fuel Genghis Khan’s war machine. The marvelous fruit has even been coined “God sent medicine” or “Liquid Gold” in the Tibetan, Chinese, and Mongolian cultures. It’s known as a true, natural healer for almost any illness. The fruit comes in two main extract forms, that being berry oil and seed oil. Both have vastly different nutritional profiles and are recommended for different uses. They are fantastic for the skin and internal use, but excel individually in different ways. For a rundown on choosing between the two, check out our Berry Oil and Seed Oil buying guide. Outside of oil extracts, you can find extracts from the leaf itself and also leaf tea. The leaf, although full of flavonoids and other nutrients, does not compare with the oils in nutritionally density. For this reason, the majority of health benefits and medicinal applications are currently exploiting the oils. 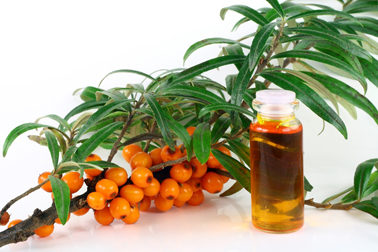 There are a variety of sea buckthorn strains naturally occurring through Europe and Asia. The most commonly cultivated species is Hippophae Rhamnoides, which has the most Omega-7 content, a rare essential fatty acid found in record high levels within the berry. They are extracted in various ways, including Super Critical CO2 extractions and the standard cold press.